In 1853 the territorial legislature of Minnesota passed an act establishing a number of counties along the Minnesota River, Le Sueur County was among them. The earliest settlements in Le Sueur County took place along the river which, as a navigable stream, provided European man with a highway into this part of the Minnesota Territory. The first towns established in le Sueur County or what was to become Le Sueur County, were established, platted and built along the Minnesota River. They were Le Sueur, Ottawa and Kasota - Kasota being the earliest. During the 1850s, the Minnesota Territory began to receive large numbers of immigrants from the east, both native-born and foreigners coming to this country for the land. Shortly after the beginning of settlement along the Minnesota River in southern Minnesota, these people began to take up lands away from the river. By the end of the 180s, most of the towns that we have in Le Sueur County today had been established. The first three: Le Sueur, Ottawa and Kasota, along the river, but also Cleveland, a few miles inland, Waterville and Elysian, were established in 1857. Cordova, Kilkenny, Lexington, Montgomery and New Prague has seen their beginnings as well. The center of the county, however, was without settlement of any size. People living in the center of the county were isolated from markets, from mail service, from schools and from the facilities that made commercial life possible. The roads that connected the various towns in the county to each other and to the river communities were hardly more than muddy tracks through the woods. All of Le Sueur County was covered with what was known as the "big woods" - a very large tract of deciduous hardwood timber that stood between that prairies of the southwest and the pine forests of the northeast in Minnesota. The soil was black, heavy and, when wet, very sticky. The soil (the land) was what brought the settlers to the county and was their inducement for sending their lives working in the woods far from any population center. 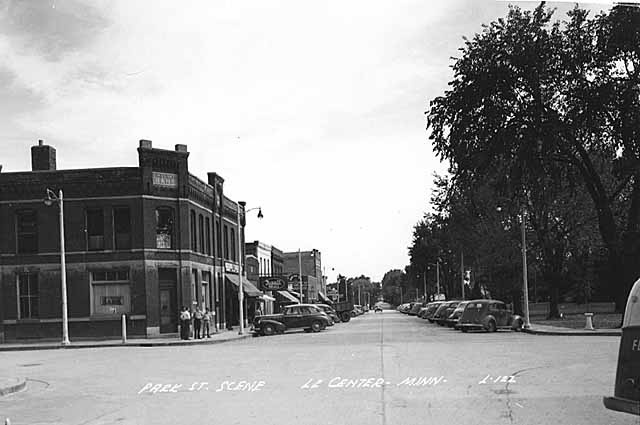 Le Sueur was the first town of any large size and it was designated by the legislature as the county seat. It stands in the northwest corner of the county and the result was that most of the people living inland, had a hard time getting to the county seat for necessary business, to pay taxes, to serve on juries, to attend court, to register land sales and to trade with the various purveyors of services. Before long a climate of opinion arose to the effect that the county seat should be relocated. At first there was an attempt by the Cleveland community to acquire it, which after a failed attempt, in 1875 they were given the county seat. A number of businessmen, led by L.Z. Rogers of Waterville undertook to make possible the location of the county seat near the center of the county by acquiring a tract of 160 acres at what is now Le Center and platted it. They offered the use of a newly constructed two story brick building to the county board for use as a courthouse if a referendum of the people of the county agreed to allow the moving of the county seat to this new location, which they chose to call Le Sueur Center, and elected as the new county seat in 1876.